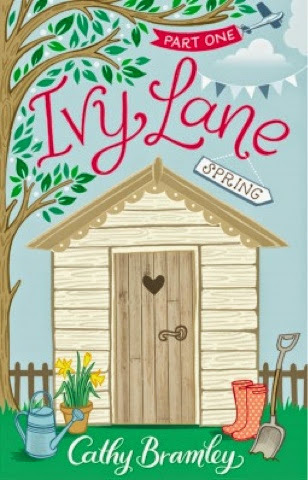 Ivy Lane is a serialized novel told in four parts - taking you from spring to summer, autumn to winter - which tell a charming, light-hearted and moving story you won't want to put down. Review: what a lovely little tale this was! I love the idea of a serialised novel, a bit like The Arcade by Kitty Charles but longer. This first instalment in the serial definitely has the desired effect of making the reader want more! You're brought right into the action with main character Tilly getting up on New Year's Day and going to pursue her new project-her allotment. We find out that Tilly has been through some things recently, and we know they might involve a previous partner, but we are never told exactly what, or who, was involved and that is just so teasing and tantalising and will definitely have me grabbing the next installment as soon as it comes out! Tilly is a lovely character, I really warmed to her as the story progressed as she warmed to the other characters in this novella, these things happened almost in parallel. She seems rather afraid of getting too attached to people and I think this gives us a clue as to what has happened to her in the past. The funniest thing is that she seemed totally clueless about gardening and so this provides some real comedy moments as the story progresses. There are a host of other characters in this novella, all of whom developed as the story went on, but we don't find out too much about them all, meaning that they will probably reveal themselves further in the next three instalments of this serialised novel! The storyline itself was sweet. It was a nice easy read and nothing too dramatic happened. I love the fact that it features a teacher, and does paint teaching from a relatic point of view, you have reports to write, planning to do and get ill every holiday-well done to this author for including all of these aspects in this novella, I hope they will continue to be a feature of the next few instalments. I also really loved the fact that her mum loved in Harrogate! This bit was very well-written, so you cold tell this author had actually been there (my home town). I found some of the gardening references a little dull in parts, just because I have no interest in gardening whatsoever, but there weren't too many complex ideas to take in, you plant stuff, it grows, so that was good. There were some real funny moments in this novella and overall it was sweet and endearing. Being at around 85 pages, this book made a nice short break from a full novel and is definitely something you could read on your commute as it was easy to pick up and put down. I will definitely be read the Summer instalment as I am incredibly intrigued to find out more about Tilly's last and also about the other characters on the allotments. This is perfect reading for this time of year, being spring and all, but I think it would work well later on in the year too, giving new hope to dull days!